Extract the arils/seeds from half a pomegranate and set aside. Mash the avocado and all ingredients except the pomegranate arils until well combined. Mix in the pomegranate arils last. Top with extra cilantro and pomegranate. Enjoy! I made one of my favorite sauces again--spicy peanut sauce. You might remember it from my Red Spicy Peanut Noodles earlier this year. This time I paired it with a baked diced sweet potato, tempeh, and zoodles (zucchini noodles). I'm all about toppings- the more the better! I topped this dish with cilantro, coconut flakes, chopped peanuts, key lime juice, and sriracha. Hope you enjoy! In a saute pan, heat oil over medium heat. Add tempeh, nutritional yeast, and liquid aminos. Cook for about 15 minutes over medium heat. Once the tempeh is done, set aside. Spiralize 2 zucchinis with a spiralizer. Add oil to the same pan along with the zucchini noodles and black pepper. Cook for about 5 minutes or until softened. While the noodles are cooking, heat a sweet potato in the microwave for about 6 minutes, then dice after it has cooled. For the sauce, combine all ingredients in a bowl and whisk until combined. Add the sauce to the pan of zucchini noodles and heat for 2-5 minutes. If you're looking for something tangy, savory, and sweet- here it is! 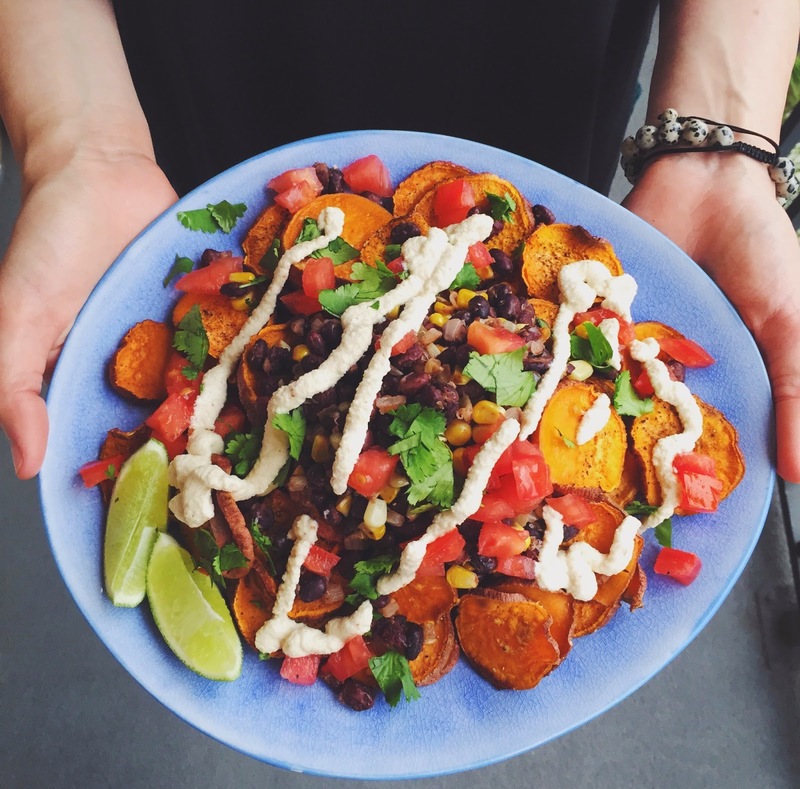 These Sweet Potato Nachos are perfect for a weekend movie night. If you're planning on making these, make sure to soak your cashews in advance. I like to keep some on hand in the fridge-- they're great in smoothies too! Heat oven to 400 F. Cut the sweet potatoes into thin slices and place on a pan for roasting. Top with the oil, salt, and pepper- to taste. Cook for about 45 minutes or until crispy. Combine all hash ingredients in a saute pan and cook over medium heat for about 25 minutes. Combine all cashew cream ingredients in a food processor and combine until smooth. Add more or less water depending on desired consistency. This Cashew Hemp Seed Pesto is creamy, easy to make, and so versatile! I used it as a polenta topper here-- by using a little less water I made it more like a spread. It works great as a sauce for noodles and veggies too! I've really gotten into hemp seeds lately. They're a complete protein with all essential amino acids and a good source of omega-3's. Between the hemp seeds and cashews, this pesto packs some protein! Process all ingredients in a food processor until smooth. Enjoy! This is one of my favorite carrot-based smoothies--kind of like having dessert for breakfast, but with all nutritious ingredients! Whenever I can recreate a dessert in smoothie form, I do! I even snuck in some turmeric for some anti-inflammatory action--and great color. Simply combine all ingredients in a blender. Enjoy!